How has it come to this? Six detention deaths in seven months. Five of these are suicide. If these were not asylum seekers, there would be an uproar. Will this latest death of a 19-year-old Hazara in Curtin be the catalyst for the judicial inquiry needed to investigate mandatory detention? This boy's friends tell of his distress when decisions were handed out to arrivals from boat number 225. This boy could not understand how he, who had arrived in boat number 170, was still waiting. The ways of immigration have ever been arbitrary and capricious. To a mind struggling to survive this inexplicable decision-making, this was the too much to bear. He went to his donga and locked the door. His friends arrived too late. The deed was done. In 2005 Australia faced a similar situation. People in long-term detention in Baxter were falling apart psychologically and physically. Then along came Cornelia Rau, an ex-Qantas Air Hostess, lost in the immigration detention system. Her case opened up the detention system to public scrutiny, as the department and government squirmed. An Iranian detainee said "Cornelia was an angel for us, but she did not know it". It was the detainees who kept telling us about this blonde woman "who should not be here". When her family found her through a media story, immigration rushed her off to hospital. It was her sister who reminded us about the mentally ill people in detention who did not have Australian families to rescue them. Suicide prevention involved placing people in isolation cells for weeks at a time, handcuffed and restrained with 24-hour camera surveillance. While this prevented deaths it was hardly therapeutic. This regime came to an end when Adelaide lawyer, Claire O'Connor took the cases of three mentally ill Iranians to court in April 2005 seeking treatment on the basis that the Immigration Department owed them a duty of care to treat mental illness and not to continue to detain them in conditions which undermined their mental health. Over the next year hundreds of people were discharged to hospitals in Adelaide, Sydney and Brisbane and the community. Detention centres slowly emptied as people had to be released and the victims of the 2000 wave of asylum seekers crept out into the light to begin their lives in freedom. Some succeeded in regaining their health and others are still fighting the demons of detention fears. In July 2008 a new government and a new minister proposed New Values in immigration detention. Value 5 states detention in immigration detention centres is only to be used as a last resort and for the shortest practicable time. Sadly these values were not enshrined in legislation and then along came the boats. The new dawn was over. Another policy entitled "Identification and Support of People In Immigration Detention Who Are Survivors of Torture and Trauma" was introduced in April 2009. This document states repeatedly that people who have been tortured must not remain in detention and must have their cases processed as soon as possible. This document is ritually ignored. Why is it that having recognised the failures of detention centres, that we have now come full circle. We are back are facing deteriorating conditions, broken hearts and spirits and now six deaths in seven months. Just this week past a man, imprisoned in Iran for seven years because of his family's politics, was finally released into the community after nearly a year in detention. This man has been tortured "like in the middle ages". He was recognised as a refugee after five months but languished in detention for a further seven months while awaiting security checks. He has finally been released into community detention while he waits for a process that has taken three times the expected time. Right now, this morning, a woman, who was imprisoned on political grounds in a country known for brutality to political protesters, sits in an isolated detention centre struggling to live. She has been raped and tortured and has the marks to prove it. After four months she has not even been interviewed. Will she survive detention in Australia? There are teenagers from a country where boys are kidnapped and raped, in our detention centres, unable to sleep and haunted by their experiences. Some are cutting themselves to relieve the pain in their heads. Six deaths in seven months is a ghastly statistic. 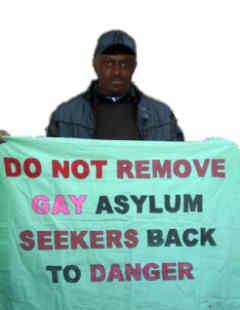 No-one chooses to be an asylum seeker but we can choose how we treat asylum seekers. Locking them in detention to face additional suffering and mental trauma is not a choice we should make. It is time we came to our senses and demanded an end to mandatory detention. A judicial enquiry would a valuable first step on this path. To do nothing is to invite more deaths in detention. Pamela Curr is the campaign coordinator at the Asylum Seeker Resource Centre.